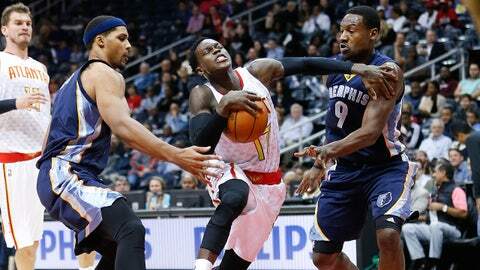 The Hawks and Grizzlies open their 2015-16 regular-season schedules next week. 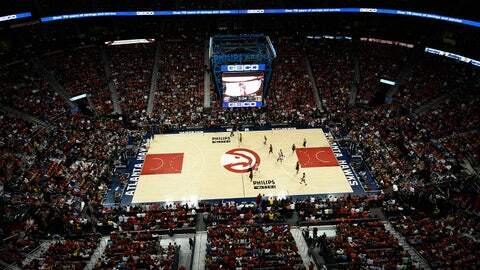 ATLANTA — One game away from the franchise’s most-anticipated regular season in recent memory, the Atlanta Hawks were reminded what the regular season can look like on Wednesday night. Sometimes the pace grinds to an absolute halt. The Memphis Grizzlies were in town and, true to reputation, they seemed set on making life — even preseason life — miserable for their opponent. "That’s probably the wrong team to find our rhythm against offensively," Hawks coach Mike Budenholzer quipped after his team’s 82-81 preseason loss. Preseason games played at this pace and intensity can be helpful, though, a reminder of those regular-season and playoff clashes that crawl possession by possession. It’s the rare preseason outing where efficiency goes under the microscope. The clash of styles can be a helpful reminder that, at times, teams have to dictate their preferred pace. Rarely is this more apparent than when uptempo-type teams take on Memphis, which graded out as the fifth slowest-paced team in the NBA last season — a statistic that seems to overestimate the Grizzlies’ preferred tempo. Throwing preseason games into the mix, the Hawks are 1-6 against the Grizzlies under Mike Budenholzer. (Of course, nearly half of those games do not count toward anything.) There’s a reason for this: The Grizzlies are very good, and very good at playing to their strengths. "They go deep in the playoffs every year and they always have a chance to win the trophy. They’ve been together for a while," said Kent Bazemore, who finished with a team-high 18 points, his best game of the preseason. "Same thing we’re trying to create here, a bunch of guys that have been together for a while. … You’ve to give them credit, though. They stuck to their (strengths) and wore us down." In particular, the Grizzlies’ defensive presence and slow-it-down style forced the Hawks, at least in the late stages, to practice dictating their pace. There is perhaps no better test for this ability than a clash with the Western Conference’s plodding sledgehammer, the inside-out nightmare that pushed Golden State farther than any other opponent last postseason. "They kinda just wear on you," Hawks guard Kyle Korver said. "That’s who they are." None of this carries weight, of course. NBA champions aren’t crowned in October — in fact, the defending champs own a 2-4 preseason record with losses to Portland, Denver and the Los Angeles Lakers. The Cavaliers went 1-6 this preseason. There are no trophies given for hitting your stride in training camp. Still, as far as dress rehearsals go, this was useful business. All-Stars dotted the floor in the fourth quarter — taking the place of the early-preseason names at the end of the bench (and roster) — and there was something to play for until the final seconds, when Bazemore missed a 3-pointer with time winding down. It was, if anything, a refresher course for players’ regular-season psyche. "To have a fourth quarter in a preseason game with some intensity – coming back, making a run, get in a position to win a game, having a few plays that we didn’t make. Those are the kinds of plays that you’ve got to make in the regular season," Budenholzer said. "So I think in a lot of ways really for both teams, both coaches, we got to play some of starters starter-type minutes."